Tiffany, Nicole and Alan are excited about their entry in the annual Best Tech Idea contest. But they are up against the sly Frankie twins who will do anything to make sure they are the winners. In a race against time, Tiffany, Nicole and Alan find an idea from an unexpected source. Can the smart trio outwit the sly twins and win the prize? Join the global initiative of raising the next generation of creative leaders, engineers and scientists. Thousands of kids are being catapulted into the magical world of S.T.E.M (Science, Technology, Engineering and Math). This book is ideal for kids who are creative thinkers and problem solvers. 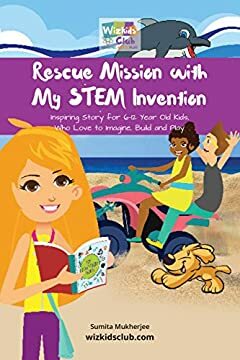 Through the story of the STEM enthusiastic kids in the book, children get inspired to look at real world problems and find solutions. It is thinking outside the box and scientific progress that can save the day.